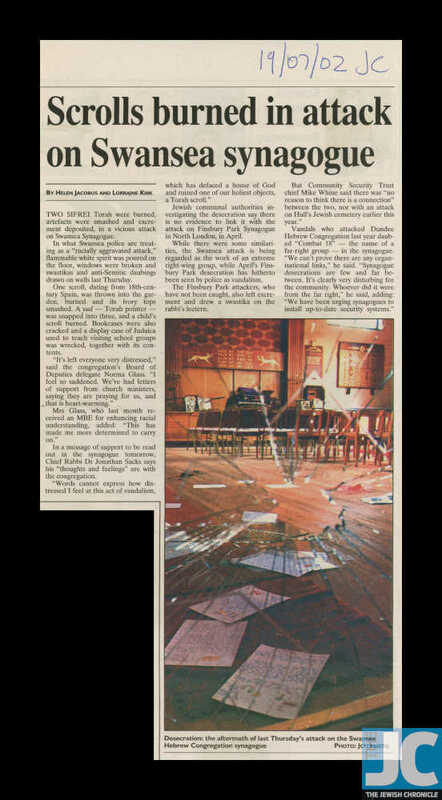 This newspaper clipping from The Jewish Chronicle reports on a racially aggravated attack on the Swansea Synagogue. The vandals burned two Torah scrolls, one of which was made in Spain in the 18th century, smashed things, and drew antisemitic daubings, including swastikas, on the walls. The attack resembled the one that took place earlier that year at Finsbury Park Synagogue in North London.